The geyserwise manuals and videos can help you to understand your Geyserwise timer device. 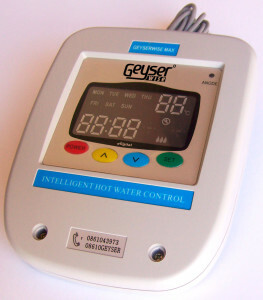 The geyserwise manuals are easy to use and provide valuable information when you want to change the settings (timeslots for using Eskom power) or to change the maximum temperature for the geyser water. Have a look at the back of the geyserwise manual for the corresponding error code and you will see possible reasons for the error. This will help us to assist in order to come prepared or maybe offer some solutions you can try before our technician is called out to your home. Video 2: To set the time slots for when the timer must use Eskom power to heat the geyser water.